The Nordic country of Finland endures arduous winter months; it’s entire nature persisting in the cold with no sunlight. As winter transitions to spring, and spring into summer, a beautiful, rejuvenating contrast begins to present itself. As the nights get shorter and shorter each day, an annually occurring natural phenomena begins to take effect. Midsummer is widely celebrated throughout Scandinavia and the Nordic countries, and the reasons for this come as no surprise. As well as the human population of Finland, a number of other species thrive off this revitalising climatic transformation. One of Finland’s 188,000 pristine freshwater lakes in midsummer, from above. Where Finland borders Russia in the Kuhmo region, a healthy population of European Brown Bears flourishes. By late June, most Bears have finished breeding, encouraging individuals to disperse across their territories and beyond, as they forage throughout the productive boreal biome. Just like all other species in this wild country, Brown Bears can be observed, utilising the extensive daylight hours of midsummer. But what exactly is it that makes this unique time of year so popular? During midsummer, the tilt of the earths axis exposes the northern hemisphere to more sunlight, as it is closer to the sun. The midnight sun can be enjoyed for longer; the further north you travel, during this magical season. The main difference is the unique and incredible nature of the light present. Warm, bright light bathes the boreal landscape, casting daylight which persists for almost 24 hours. In the time that the sun dips below the horizon across central Finland, temperatures drop, cooling the surrounding lakes to produce magical mist. Sunset over the main lake in the hide area, on a serene midsummer evening. It is during the slightly less bright ‘blue hour’, where eerie ethereal light can beautify the landscape. The sound of distant footsteps, slowly splashing through the swamp, reach the crescendo before diminishing, as the ghostly figure of a Brown Bear shuffles past your hide, disappearing into the indefinite twilight. A large male Brown Bear emerges onto the swamp amongst the cottongrass in a ghostly twilight. As the sun rises back above the horizon, just 2 hours after setting, a carpet of fresh, green summer vegetation is revealed. The forests and swamps come alive in late spring, and continue to thrive throughout midsummer. The iconic cotton grass flower decorates the open swamps; as it’s delicate tufts sway in the summer wind. The pure, freshwater lakes enhance this wild environment, supporting the perfect ecosystem balance, sustaining a unique array of species. A pale female Brown Bear emerges from the forest edge on a calm evening, her shape reflected into the still water. Male Brown Bear at sunset in midsummer. Mirror like reflections of a Brown Bear circumnavigating the lake. Wading birds use the lakes as a pit stop to forage, as the forests breeding birds are busy at work raising their young. As the twilight diminishes, the eerie call of a distant Black Throated Diver echoes through the swamp. Brown Bears and Wolverine emerge from the dense forest, navigating the open landscape with ease, and are very active in their determined search for food. Occasionally, the true ghost of the Boreal forest will appear. Grey Wolves circle their huge territories throughout the year, and may pass through the area offering a rare glimpse. One of Finland’s largest Brown Bears passes beside the Western lake in stunning midsummer sunlight. Midsummer is a national holiday in Finland, when people take a break to enjoy a number of traditions as a celebration of the summer solstice. Whether in the forest or beside a tranquil lake, there are countless spots to enjoy yourself in a peaceful hideaway. The boreal forest in summer photographed from above. 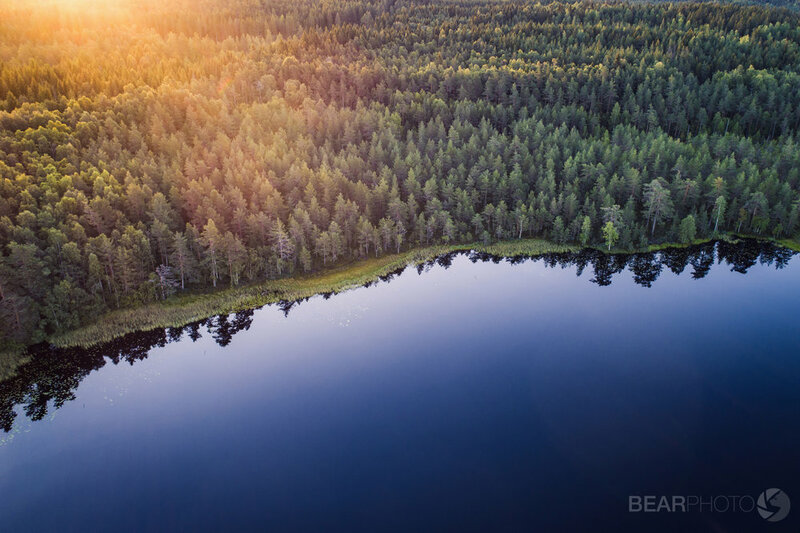 A typical tradition during midsummer is to enjoy a calming swim in one of Finland’s 188,000 natural lakes. This is often accompanied by bathing in a traditional sauna. Midsummer is the perfect time to immerse yourself in some of Europe’s most pristine wilderness. The wooden pier overlooking ‘Erilampi’ on a still midsummer afternoon. If you would like to experience this special time of year, click below to request an itinerary for our 2019 or 2020 Finland Brown Bear photography tours.